If you anticipate a certain level of absurdity in a horror-comedy from the guys most known for writing and directing a movie called Zombeavers, you’re not wrong. And if you lament the current lack of campy, 1980s style technology-run-amok sci-fi-horror in the vein of Chopping Mall or Night Vision, Jordan Rubin’s The Drone has your back. The plot of The Drone is so simple it may be genius. 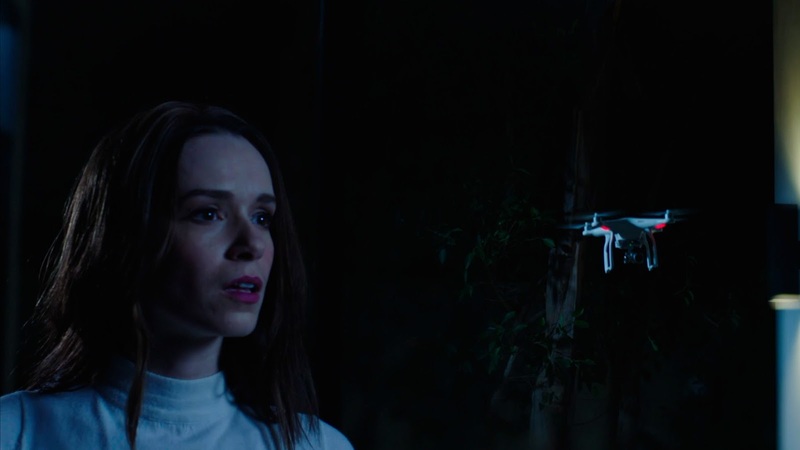 Borrowing a page from the Child’s Play playbook, the script from Rubin and Jon and Al Kaplan follows a newlywed couple, Chris (John Brotherton) and Rachel (Alex Essoe), terrorized by a high-tech drone that just so happens to be possessed by the consciousness of a newly deceased serial killer. Easy. 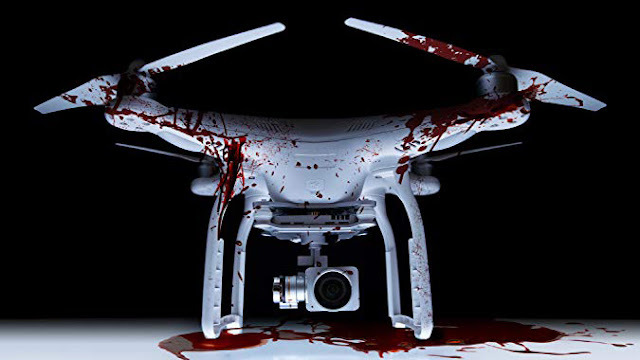 Like with Zombeavers, right out of the gate, you probably know whether or not you’re interested in watching The Drone. If this description sounds like the worst idea you’ve ever heard, you’re probably right to stay away. However, if you think that logline sounds rad, you’ll likely have one hell of a good time with this one. 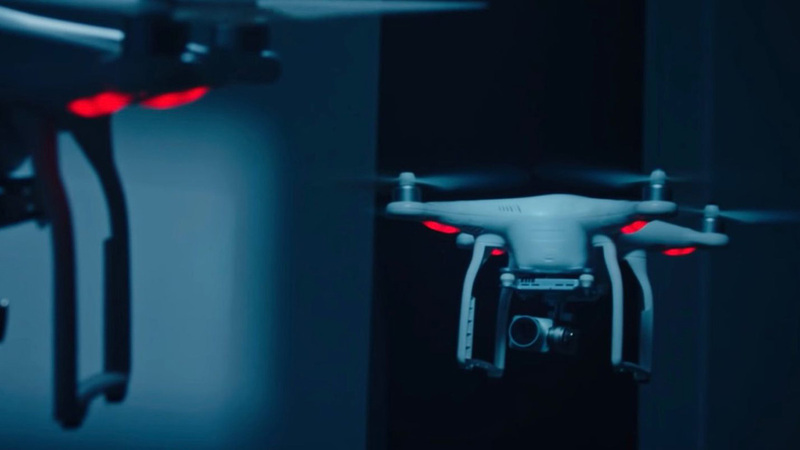 The Drone is cheesy and silly and goofy, all by design. Best of all, it plays all of its inherent ridiculousness completely straight. There’s no meta, self-referential winking here, just deep dive foolishness. Rubin and company set out to ape a certain subset of films from a bygone era and largely succeed in that aim. It has everything: a horny neighbor, world weary detectives, a scene where the drone attempts to seduce Rachel. Hell, Rachel even has a dark, troubled past with remote control devices just for kicks. 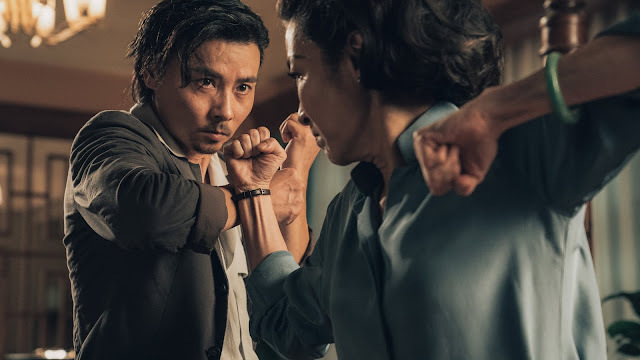 The serious nature of their approach only drives home the farcical nature of the story—it’s easy to imagine an endless supply of outtakes where the actors crack up, unable to keep a straight face while being menaced by a drone rocking on a rocking chair in sinister fashion. Essoe and Brotherton obviously have a great time and know exactly what they need to do to pull off their roles. There’s honestly not a ton more to say about The Drone. It’s slickly put together and knows precisely what it wants to accomplish. There are a few points in the middle where the momentum flags—especially as the drone meticulously frames Chris for a murder he didn’t commit and, shocker, the cops don’t believe his story—but at a slim 82 minutes, it never dallies for too long.